Emirates’ Infinite Possibilities, the futuristic exhibition stand designed to inspire travel and reflect the endless possibilities that travellers have with Emirates, has recently emerged as the winner of two prestigious industry awards. The three storey stand which allows visitors to experience Emirates’ iconic onboard features, such as the First Class Shower Spa and the Emirates A380 Onboard Lounge was declared the winner of the ‘Best Exhibition Experience’ category at the Event Magazine Awards. Held in October in London, the annual Event Awards recognises the very best in brand experiences and experiential across the UK’s live events industry. The Infinite Possibilities stand also took home the award for the ‘Best Augmented/ Virtual Reality Technology’ at the fourth edition of the Event Technology Awards held on 9th November in London. The Event Technology Awards recognise the achievements of companies delivering digital and technical solutions to the event industry across the UK. Composed of nearly 11,500 individual parts and standing tall at 8.5 metres, the Emirates’ Infinite Possibilities stand has been representing Emirates at various leading global events and exhibitions. The stand made its world premiere at ITB Berlin in March 2016 where it managed to attract more than 15,000 guests during the duration of the event. 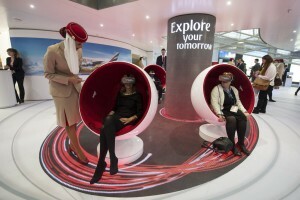 Watch a timelapse of visitors experiencing the Emirates Infinite Possibilities stand at ITB Berlin earlier this year. The Infinite Possibilities stand was also the centre of attraction at the 2016 Arabian Travel Market (ATM) in Dubai in April 2016 once again welcoming over 13,000 visitors to experience the airline’s signature onboard products and services at the region’s largest travel trade exhibition. The stand also features state of the art meeting rooms for discussions with industry trade partner and suppliers. Guests can also experience Emirates’ award winning hospitality and fine dining at the hospitality areas in the stand. Taking 9 days to assemble, the Emirates Infinite Possibilities stand when complete measures 528 square metres in size and weighs 166 tonnes which is almost one third the weight of an A380 aircraft. At events, the size of the stand allows it to accommodate close to 350 visitors at any one point of time. • The triple-deck stand is 8.5 metres high and takes about nine days to assemble. • The footprint of the stand is 22×24 metres, equalling 528 square metres. That almost equals the footprint of the A380 cabin (550 square metres). • The stand consists of 11,481 individual pieces and components. Some 30,000 nuts, bolts and screws hold the stand together and it has over 100 kilometres of electrical cabling. • The total weight of the stand is 166 tonnes, equalling approximately the weight of a blue whale. The weight of an A380 is three times higher (560 tonnes). • The aluminium mesh of the outer skin incorporates over 1.2 kilometres of strip-LED lighting. • After each event the stand is dismantled into 26 shipping containers (each 40 feet long) and travels around the world representing Emirates at a number of high profile events. • State-of-the-art technology including a bespoke interactive meeting system and floor to ceiling curved LED panelling. • The A380 Shower Spa unit in the stand features a working shower and underfloor heating. • On the private first and second floors the stand features seven meeting rooms, one Majlis, two executive offices, two serveries and two fully-functioning kitchens. • The stand can accommodate 350 visitors at one time.